At this time of year as we say farewell to another year, it’s a great opportunity to reflect on the last twelve months as well as plan for the exciting times that lie ahead particularly for those planning a wedding over the next couple of years! In a year that saw us celebrating our 5th birthday (how quickly has that gone!) 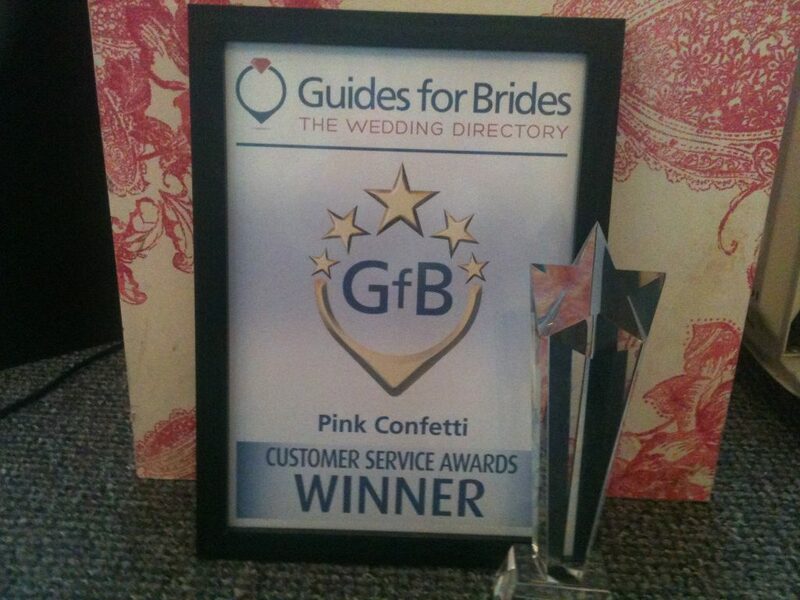 we were delighted to be awarded the 5* Customer Service Award for the whole of the Midlands region by Guides for Brides, one the largest online wedding directories. Providing a high level of service for our brides has been our key aim since we opened in 2010 so we were ecstatic to win particularly as the award is based on the feedback received from our customers. It’s wonderful that we’ve also been nominated again this year so finger’s crossed! Also, last year, we saw over 150 Pink Confetti Brides walk down the aisle on their big day! Although when the day arrives it’s a mix of emotions – happy that the day has arrived but sad that our journey with our bride is over! For those that have visited us you will know that we offer an extensive range of shoes and accessories so we don’t actually know the exact number of brides wearing a little bit of Pink Confetti! But we never forget what a privilege is it to be a part, however, big or small of such a wonderful occasion. Throughout the year we got to meet so many lovely brides, their friends and families, not to mention a few groom’s or two!, at the many wedding fairs we attended. We’re off to a flying start in 2016 with six wedding fairs in the first two months – with more to follow in the spring! We love being out meeting brides-to-be face to face and having the opportunity to chat about their plans and dreams. If you’re planning on getting married either this year, next year or even 2018 why not pop along and say hello. These events are great for picking up ideas for your big day whenever this is! There can be a lot to see and take in so plan ahead and check out our hints and tips for getting the most out of the wedding fairs you visit! It’s the beginning of an exciting year and who knows what the next few months will bring, but we feel that it’s the start of an amazing year for us and we hope for you too – especially to all our lovely brides who can now say ‘I’m getting married THIS Year! !’.